Question - A guy opens a site on his PC and utters WTF loudly. Why does he do that? ^^ Sorry to say,.. but in Gujarat we say,..
ખાસ, કયીન જાય્મ્યુંન નહીં, બોસ્સ ! I agree, some may be of repeat. Major never discussed on the very thread. Most interesting Maths puzzle going around in the world. Are you the genius who can solve this? Albert: Then I also know when Chery's birthday is. Oh ! Come' on !! That’s an old now, yaar ! Circulating for last 10+ days. Nthg in it. If you had read my earlier post,.. there had a “ color of the hat ” identifying puzzle where the guys are standing on the ladders and have to tell the color of the hat correctly, or the guy will be crucified,..
this is the same riddle. Ask,... if it needs any further explanation. I don’t think so, it should. Last edited by Jagmohan; April 15th, 2015 at 02:18 PM. The Answer is not July 16th. It's August 17th. Correct answer is what Jagmohan says.. at least in his parallel world that's the correct answer, how dare you challenge him? Google ' never challenge jagmohan ' and you will know. Lol. U guys funny ! tell ya ! for diff. Maths / Logical puzzles every week / every month ! Haan ! Cheryl has told secretly and privately ONLY the month of her b-day to Albert. Cheryl has told secretly and privately ONLY the Day of her b-day to Bernard. Naturally, because,… he knows only the month and every month has more than one dates related to it, in the table of “10 probable answers”. Albert was sure Bernard hadn't known, so he knew it was not on 18th or 19th, so it's not in May or June. Bernard realized the birth date after Albert's phrase, so, it can't be on 14th day. Now,… July 16, Aug 15, Aug 17 remaining. Albert found out the birth date after Bernard's replic, so, it's not in August. Last edited by Jagmohan; April 16th, 2015 at 07:37 AM. Chal .. diya .. july 16 it is. I was just testing you. Green circles are the given, probable 10 answers. Vertical lines are Days, only Bernard knows. Elimination of 3 leads to the Elimination of 4, as that one is the only remaining in vertical column, if Bernard was told the date of 17th, he must had used above logic and would had vomitted that as an answer, but he did not, so elimination of 4. How Albert knows that Bernard does not know? If Cheryl has told Albert that her B-day month is May or June, then it was possible that her B-day could be May 19 or June 18. This means, Bernard may know when Cheryl’s b-day is ! The fact that Albert knows that Bernard does not know, and it means, Cheryl had told Albert her birth months as either July or August ! So, Elimination of 5 and 6. Initially Bernard had no idea of Cheryl’s b-day, but now after Albert spoke smthg,.. how did he know? Now out of the remaining dates, 14 is still occurring twice,.. and hence If Cheryl had told Bernard that date, Bernard would not have still known the B-day ! But Bernard now knows the b-day, so the B-day can not be 14. Elimination of 7 and 8. After Bernard has spoken,.. Albert also now knows the Cheryl’s B-day. If Cheryl has told Albert her’s birth month as August, Albert would not have still known, ‘coz, still there are two possible birthdates in the month of August ! Hence, August month is out,.. n' elimination of 9, which is in August ! So ?? Remaining green circle, July 16 is a winner ! Last edited by Jagmohan; April 16th, 2015 at 09:57 AM. tch tch tch.. itni kaata peeti. waah waah ! beta is baar exam me bhi acche number le ke papa ka naam roshan karna. ya phir papa ki nameplate pe bulb lagva dena. 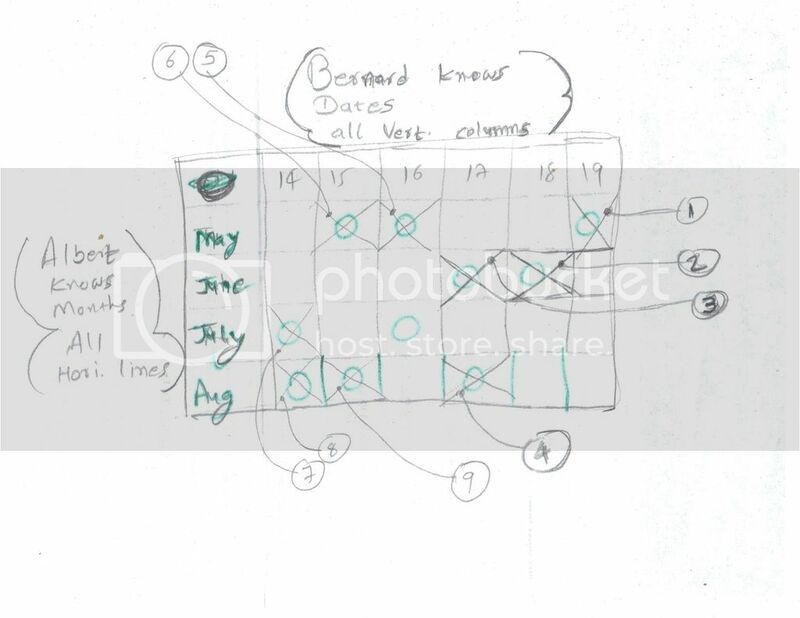 Elimination of 3 leads to the Elimination of 4, as that one is the only remaining in vertical column, if Bernard was told the date of 17th or Albert was told the month of June. How Albert knows that Bernard does not know? If Cheryl has told Albert that her B-day month is May or June, then it was possible that her B-day could be May 19 or June 18. This means, Bernard may know when Cheryl’s b-day is ! The fact that Albert knows that Bernard does not know, and it means, Cheryl had told Albert her birth month as either July or August ! Initially Bernard had no idea of Cheryl’s b-day, but now after Albert spoke smthg,.. how did he know? Now out of the remaining dates, 14 is occurring twice,.. and hence If Cheryl had told Bernard that date, Bernard would not have still known the B-day ! But Bernard now knows, so the B-day can not be 14. Hence elimination of 9, which is in August ! so, labor is worth of scanning and of writing a single long explanatory post. It will be read by 1000s, as Internet is still struggling for "easy to swallow"
spoon-feeded, understandable answer ! Singaporean Math puzzle biyaatch Cheryl fakked all ! ( at few places, I gave this link, to come here ( EC ) and read for the answer ! ) lol. This puzzle is on r2iclubforums, skyscrapercity, xossip and tons of twitter and FB pages and all blaming Cheryl biyath, but now the game is over. Last edited by Jagmohan; April 16th, 2015 at 09:38 AM. 'x' married 'z' twice his age, left her & now married 'y' 1/2 his age. Wat's d age of 'x'?